THANK YOU FOR REMAKING THE MAYA QUICK RELEASE. First, even though I have full fenders on my bike (so that I don’t get a mud stripe up my back) I noticed that the rear bike tire throws water and grit at the pivot tube. This gets into the sleeve and causes wear on the plastic bushings. To solve this I cut a 2L plastic soda bottle and fastened it to the fork to act as a mud guard for the pivot tube assembly. See attached photos. The guard is currently held on with copper wires so that I can try various shapes/sizes of bottle. When I get a final design I will use zip ties to attach it more permanently to the fork. For example, I think I should have left a bit more of the “bottom” of the bottle (it is mounted upside down) because some grit still gets through the gap and onto the top of the bag. Second, I did not like seeing the bottom of my bag get water and dirt thrown at it from underneath, so I added a light-weight base plate to the trailer. I happened to have several pieces of vinyl siding from the house that fit perfectly. The groove profiles on the siding lined up quite nicely with the various bracing rods of the trailer, so everything is held in place simply by looping the vinyl over and under the rods. Additionally, the grooves will allow shedding of any rain water that may come from above. There is still enough room beside the vinyl pieces for the bag velcro loops to catch the trailer frame tubes. See attached photos. There are 2 interlocked pieces forming the front and base, and a third independent piece at the back. I did cut two small notches into the siding “curl” at the front to accommodate the trailer frame. The colour was also a terrific match!!! I hope you like what you see. Perhaps you would consider adding some variant of these features in future models. I drive a Terra Trike Sportster on a Metro DC commute and have even taken it on extended journeys from the Smoky Mountains, to way out in West Virginia to the Eastern Shore of Maryland. I’ve borrowed a Bob’s Ibex bike trailer from friends, more than once. Liked it, but in the end the price performance ratio in my non bike, but three wheeled Terra Trike configuration just did not seem worth it. Some friends had the low cost Chinese manufacturer Maya Cycle bike trailer knockoffs, which I did borrow on extended trips and I found them wanting. Mostly in the area of quality and ease of fitment / connection to the Terra Trike. Finally called up the Maya Bike Trailer Manufacturer to order it just before Christmas 2015. I wanted to speak directly with the company, because I had figured out that it was not part of a giant outdoor sports gear company, like the Bob’s bike trailer line. Actually got to speak with the head designer and founder of the company, who happens to have migrated to North America from Eastern Europe, and who has a long history of bike camping and trailering, thus this is his design. His Maya Bike Trailer design focus is entirely on “less is more, ” when compared to what some consider the “Standard” in the form of Bike Trailers from Bob. If you need the ego boost of buying a Bob trailer, go right ahead. and spend nearly twice the price of a Maya Bike Trailer. “Less is More” really does work just fine. Thus I can’t recommend this Maya Bike Trailer enough. If you want a trailer that tracks better, (compared to other trailers I have tried with my trike) is lighter, and tilts nicely on turns (yes trikes can tilt on banked turns like some on the Mt Vernon Bike Path or on twisty mountain downgrades), then I can’t recommend the Maya Bike trailer enough. It all works fine and it is roughly 1/2 the price of some of the Bob’s trailers. I’ve put close to 500 miles on it since Christmas. It has been loaded to the max as I traverse pothole full DC streets, country roads on the Eastern shore, and when I’m zipping down a 7% grade at almost 30 MPH (with the Maya fully loaded at almost 50 pounds) in West Virginia mountains. And those downgrades are chuck full of twisty compound descending mountain curves which the combination of my TerraTrike and Maya have no handling issues and other hassles at all. The trailer even gracefully handled 8 X 500 sheet packs of printer paper from my local staples for a total of just over 40 pounds and did not balk or bend. On the first day, I loaded it up with a ton of groceries from my local COSTCO warehouse store. And now every weekend I do my grocery shopping with the Maya Trailer attached. A note about the Maya trailer. I did buy the new style skewer / attachment kit. On my trike the old one did work, but you know, the new one is just plainly better, so just buy it. The new skewer / attachment kit did not pop out or shift on the very high torque I did apply to my rear wheel when I started from a dead stop at the bottom of a long 7% West Virginia mountain grade. On that day, I had a fully loaded trike (panniers + plus me for a total of probably 350 pounds,including the Terra Trike) plus the Maya Trailer with a 50 pound load. All in all probably well in excess of 420 pounds on 2 -20 wheels, a 26 ing rear and the Maya’s 16 inch wheel. This is an important issue, because if the skewer pops out or the skewer shifts, I can have a rear derailed shift and get tangled into my rear spokes. All in all, with the Maya Bicycle trailer attached, it is like it was not there. In fact, more than once I had to look in my review mirrors to make sure it still was there, as it was like nothing at all was attached. So in a few words, I love it totally, and it has held up well due to the quality of its manufacturing. Did I add to it? Yes I did. I used a Danish magnets on the wheel lighting kit on the rear wheel, so I have an always on flashing tail light. That is just my personal preference, as I ride a great deal and do not take chances. I did explore getting a new 16 inch wheel with a hub dynamo from Son built from Peter White Cycles, in NH, but I think I wait a few weeks to see how my Danish Magnetic light kit works. So in a word, if you want a great bike trailer for your human powered vehicle, just buy this with the extra new skewer / attachment kit. And enjoy the fun it adds to your life as it allows you to spread out your load and to carry enough to be self sufficient without any significant drag, even when loaded to 50 pounds. Loving my Maya Cycle Bike Trailer! Two minute switchover to my road bike and the kickstand are GR8 features. I was the January winner and make good use of it often. Thanks again GR8 product! I won a Maya Trailer about 3 years ago, and it is still in very good condition, I have used it much more than I expected. Because I am disabled and am unable to drive, I use my Maya for everything. Thanks for this opportunity and good luck to all who have entered. I really do love my Maya trailer. I just won a spot on the “Ride the Rockies” in June of 2016, which you can look up. I can’t use my Maya trailer, as that is not permitted under the rules. But, I had an idea. I expect to get the Colorado a week before hand to acclimate myself to the high altitude. I realized that I could ride over mostly rural roads to the starting line at Carbondale, Colorado in less than a week (200 miles) using my bike and my Maya trailer. A happy Maya bike trailer user. Hi there. I have been the proud owner of a Maya bike trailer for a couple of years and I am hoping to win another for my wife, Hazel. We have used our Maya for week-long touring in Idaho and on the Gulf Islands in both BC and Washington State. Because we take our grand daughters along we have needed more capacity. Not even the Maya can handle camping gear for 4 people! We resorted to hiring a Bob Yak at great expense. Although adequate, the Bob does not compare in terms of stability and ease of connection. 3-4 years ago I won a little bit of money and purchased 2 Maya bike trailers. My husband and I used them to go to the farmers market with dreams of cycling the Oregon coast. Two summers ago we did it! We started at Astoria and took our time while on a 10 day break from work. We got as far as Lincoln City and plan to pick up where we left off. Taking transit from Linclon city was super simple with the trailers packed up like suitcases for the trip back to Astoria. My best friend since childhood (53 year friends) wants to join us for the next leg but has no gear for her bike. The great thing about the Maya is that it attaches to any bike and becomes a bike stand when stopped and a wheelbarrow when detached from the bike. With another trailer we can invite our bike enthusiast friend(s) to join us. My sister and her husband bought Maya trailers this year and will join us too. Other touring cyclists along the way were very impressed with the Maya design. Imagine if there were 5 trailers in one group! I have owned this trailer for about 2 years now its great for bike packing and has held up very well to some very rough terrain. I did a little modification to the fork so it would fit my fat bike with a 4.8 tire and it works great but I have bought a new bike and I’m wondering if I can get a new trailer fork separately so I can use it with both bikes. I had to spread the trailer forks about 2 inches wider to get it to fit my Surly Pugsly and then bend one side back in about a 1/2 inch in the middle of the blade for the offset of the frame. I did it all by eye with a bunch of C clamps. It works great, no clearance problems at all and I have used it to bike pack around the mountains of Maine and on trips to local islands here in MA and RI, Martha’s Vineyard and Block Island and have a few trips planned for this summer. The camping trip in Maine, I pulled the trailer through some rough wooded areas over fallen trees and old stone walls and even hit speeds of 30 MPH and never once had an issue with the way the trailer handled, it took everything I threw at it and begged for more. The last pic of the lake , the mountains in the back ground were the ones we rode up 7 hours of climbing in the granny gears. Maine was actually our first bikepacking trip. This trailer has been an awesome addition to my gear and has made hauling my gear so much easier. I have recommended this trailer to people over other trailers. I’ve had my Maya trailer for 2 years now. When I got it I had done quite a bit of searching, I’m confident I made the right choice! I only have around 300 miles on it, but its been great. I’m hoping that the new quick release will spread the fork connection points out a little so I can mount by pannier rack on. The drawings look like it should. If this new axle improves the overall hook up then I can’t think of anything else to change! I’ve only had this a month. I love it! So far I’ve carried up to about 60 pounds. Great design. The kickstand, wheelbarrow handles and relatively low cost make this uniquely useful. I love my Maya Cycle trailer. Perhaps one of the best things I like is the kickstand. Admittedly I have only loaded it with 40 pounds and have only gone on one 50 mile trip and several shorter trips to the store. I don’t really feel it behind me. I will be putting it to the test next year on a trip from Massachusetts to Texas. 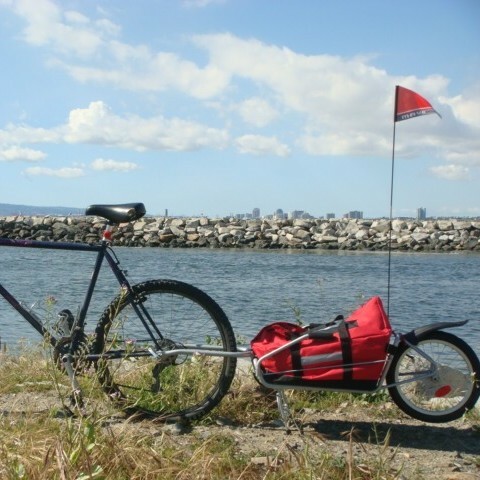 I would recommend this bike trailer to anyone for either simply shopping or long hauling. I love this trailer! It pulls like a “GHOST”. I have pulled it to and from work as well as the market. Portions of my routes are literally slaloms. I can zip through as I do when not pulling it. It is well constructed and unbelievably light.The one thing I would like to see is a quick attachment for the drawbar to the axle. I have had people mess with the trailer while in a store. So I take everything with me. I cannot risk some idiot removing the drawbar. Which would be useless to him and probably end up on the side of the road. Beyond that – Love it! Finally got a chance to try out my new Maya Cycle trailer. Worked beautifully for a nice three day weekend trip on the SE coast of Taiwan! It was the best experience and the trailer exceeded expectations on every level. Kickstand kicks a**! I couldn’t imagine ever being without my Maya Cycle. I use it every day. I am a mobile bike mechanic here in Vancouver and travel with my tools and bike stand almost everywhere I go. This has proven to be the best investment I made. Thanks! Because I had a trailer on my bike, my son (5 yrs) wanted a trailer (empty!) on his bike! He was so happy and proud he could tow a trailer too. We’re both big fans of your Maya Cycle, thank you for this wonderful product. I got my trailer today and went to the creek to jam. Very easy to set up and I barely notice the trailer behind me. Here is a novel use for your trailer. Quite effective too, in extending the length to accommodate my 11′ inflatable kayak. The rear trailer is the one I used before purchasing the Maya. 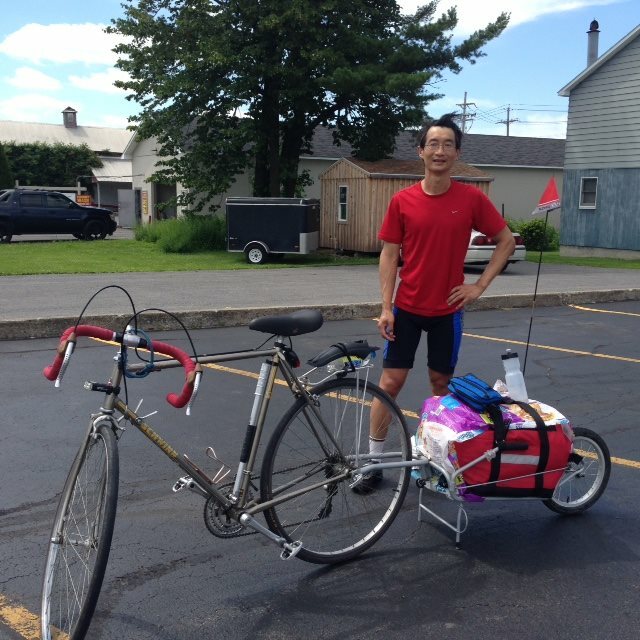 I attached Maya Cycle to my bike and then the two wheel trailer to the Maya Cycle wheel. Worked like a gem! This is the fly off my 2.5 lb. micro tent. It’s being held by 2 guy ropes and attached to the trailer at one corner. The trailer stand holds up the bike (with extra stability against wind from the ropes). The light weight collapsible chair (under 2 lbs) makes it comfy for reading & snacking. Perfect set up to wait out a storm. I still have to test it in “ugly” conditions, but I think it’ll do the job. Takes less than 5 minutes to assemble. Always finding new ways to use Maya Cycle and it’s been fun. Thanks! Here you can see me at the end of my trip with the cover. The trailer has gone at least 900 miles over gravel, trails and road. I cut an empty 40 lb dry cat food bag to use as a rain cover. Cutting two slots in front and tucking it in back kept the contents dry. Reliable piece of equipment, thank you! Maya Cycle trailer tracks very well. Removed and discarded the wheel barrow handles as they were unnecessary extra steel weight. Trailer kick stand holds up tandem! I replaced wheel with same size aluminum rim, high pressure narrow recumbent tire, and geared e-hub. Used stainless hose clamps and zip ties to mount a rack designed for front, then put front panniers and top bag. So, cargo weight can exceed Maya specs because this weight centers over rear trailer wheel capable of carrying 100+ lbs. On the picture: tandem touring machine with modified Maya Cycle bike trailer having an e-powered hub from Grin Technologies. I hope all goes well with your bike trailer business. We are happy owners – bought it from you 2 years ago February at the outdoor show in Toronto. I love it! Attached is a great picture from our trip round Georgian Bay (about 1000km). A great product design, made my travels noticeably easier and more enjoyable. Cheers! After spending nearly 2 days looking at different bike trailers, one-wheel, two-wheel, different ways they attach, weight, agility, etc. AND watching youtube videos of each one. I decided to go with the Maya Cycle bike trailer for a few reasons. One of the big reasons I picked Maya is the price of course. I have used 2 other expensive bike trailers, and found the Maya to be just as superior (if not more so) than some of it’s competitors, and for half the price! The Maya is also, slightly more light weight than the other trailers, which probably shouldn’t matter if your loading up with groceries or bike-packing. The kickstand on the trailer holds everything upright, even your bike! SO, you aren’t always needing to find someplace to lean everything up against, or having to lay your bike down. Which also makes for VERY easy quick release. Then, when you have been riding all day and are too tired to carry your gear, flip the arms around and use the ‘wheel barrow’ feature to wheel your gear over to camp. Another big thing I noticed while using the Maya, is the turning ability. The other expensive trailers use a ‘V’ type arm to connect the bike to the trailer, which I think limits it’s ability to turn. You would notice, turning, the arm will stop against the front of the trailer, and you have to take wider turns. The Maya trailer has a single arm, not a ‘V’ shape that connects the bike, so it seems to give it slightly more clearance over the frame of the trailer, and helps it turn better. Just don’t overload the trailer. I threw 50 pounds of lifting weights on the first ride, and it rode like a ghost! All in all, I am a pretty picky person when it comes to my gear, and I think you WILL be happy with this trailer around town for sure! I will let you know how cross country goes! This is an awesome piece of equipment. I’ve used it on 4 trips, I’ve never felt unstable on one wheel, it’s manufactured with high quality, and the wheelbarrow feature is great for getting to that offroad campsite. I’ve used the Bob and this is better and cheaper. The company was very helpful after a shipping snafu. Great customer service. Thank you! Also, I have always liked the fact that you could disconnect the bike trailer and “wheelbarrow” it, but I have to say I’ve rarely used that feature seriously until yesterday. We had a company picnic at the beach about five miles from my house, and I packed everything for two of us into the bag to take down there. Swimsuits, towels, wetsuits, dry clothes, frisbees, water bottles, hats, extra shoes, sunscreen, etc, and it all fit into the bag very nicely. I got to the beach, parked my bike, disconnected the Maya Cycle bike trailer, and rolled it across the sidewalk to the sand where our group was. A great product, and I hope you are doing well with it. I took the Maya Cycle Bike trailer on a 48’ish km (round trip) back woods single track trail into Fortress Lake in Hamber Provincial Park in BC with my good friend Brian, a world renowned survival instructor. The trailer tracked perfectly and any fallen trees that were low enough I just powered over. Boulders were also no obstacle. When we couldn’t ride any further the conversion to a wheelbarrow was a great addition. Though I think the handles could be another four inches longer. I can honestly say the trailer worked so well I completely forgot it was behind me. There was almost no signs of hitting the boulders and trees. The paint is barely scratched. Thanks for building a product that doesn’t fall apart halfway into a journey. Let me start by saying I love my Maya Cycle bike trailer. I had Alki Bike and Board in Seattle order a trailer for me 2 weeks ago to use for an impromptu touring trip from Seattle to SF. I picked up the trailer a week ago, Monday, August 19, went through the entire owners manual, gave it a test run around the block, loaded it up, and departed on Wednesday, August 21. So far, she handles great and people are really impressed. I’m hoping I may have sold a few future orders for you – people LOVE the kickstand! . The bike trailer has helped us immensely! We can load it up with books for children, ride them across the city, transform it into a wheelbarrow, and wheel the books right into the schools. It has been amazing. Plus, the kids think it’s really cool. At this point we have rode hundreds of miles with the trailer and it has been a great experience for us. I suggest that everyone consider these bike trailers. They are great for hauling everything from groceries to books for children. It is well worth the investment. The Maya Cycle has reached my expectations as a bike trailer and exceeded my expectations as a beer carrier! Great that it will support the bike up-right with the kickstand even with the trailer unloaded. I can see how the wheelbarrow thing could be useful. I bought the trailer over the BOB because of the innovative design features. I tested it by dragging 45 lbs of cargo around my moderately hilly – 30km loop and it behaved very well, noticeable for sure but minimal effect on bike handling/control, dragged behind a full suspension MTB. Love my bike trailer! It tracks well behind the bike, and I almost can’t tell it’s there. It has carried groceries, a 50 pound bag of dog food, and even a (small) Christmas tree, and it has handled everything great. The kickstand is our favorite feature: it holds the bike and loaded (or unloaded) trailer upright very sturdily. This makes parking and loading/unloading much easier. My cousin (who has another brand of bicycle trailer) is extremely jealous of our kickstand. In short: great product! Translation: I have to boast that I road the first 150km and the bike trailer works very well. I packed 10kg (container of water) and drove 2 x 60km. Riding down hill was rather easy. I barely felt the trailer behind me. Loving my new bike trailer! Have already made a small modification and am using an 14 gallon Rubbermaid container instead of the bag. It is completely waterproof and my groceries do not get squished with the bungee cords. Thank you for this great product! I have recently purchased the Maya bike trailer and am more than satisfied with my purchase. I am writing to tell you that I am taking my trailer into my brother’s bike shop (Ideal Bikes, Halifax) to have the store staff there have a look at it. One of the employees is a former MEC staff who was familiar with the BOB Trailers and is very interested in seeing the Maya Cycle and its advantages. I am pressuring the store (in a friendly, familiar way) to investigate being a distributor of Maya Cycles for the East Coast. The trailer performed well – a great improvement over the kiddy trailer it replaced. It’s lighter, and I hardly feel it there, except when climbing. I’ve been down hills, as fast as 50km per hour without feeling sway. I’m also very happy with the narrow profile – I never have to look back when passing through a tight passage. I’ve now put about 1000km on the trailer. I used the bag to hold my camp gear and this is working well. I like the fact that its easy to take it off the bike and into the grocery store while en-route. It means I don’t have to worry about someone poaching my stuff. We bought the Maya Cycle about two weeks ago and we are loving it. The stand is very (!!!) useful for many reasons and was the major selling point for me. We take the bikes and trailer to our son’s soccer game on the weekend and load a cooler and chairs. When we get there we pop out the trailer kick-stand, grab our chairs, and are ready to enjoy the game without having to unload the cooler and look for a place to put the bikes. Any other trailer that I have seen while searching on the web is quite useless when not attached to the bikes because it falls over. The handle bars are also great to move it around when loaded and not attached to the bike, again giving it a good functionality when not riding with the bike. Best bike trailer – loaded on a case of wine and 12 beers, might have been a bit heavy, and road up Yonge Street at Summerhill to St. Clair – made the load seem light – make sure to balance the load evenly front and back and side to side. Turns have to be a bit wider with the weight but otherwise performance is fine. I have shopped for a dinner party for 17 people – one for food and one for refreshments. Parking was easy and the trailer really helps spread the load out.  Great product – too bad someone liked the bungee cords so much they stole them. Assembly was super-easy and took just a few minutes even for me-a technodinosaur. I found the QR skewer system a bit confusing, but that was me. It took a couple of tries until I realized that my bike (a hybrid) was a bit of an oddball size. I added a washer on each side and got a perfect fit (I didn’t want to adjust the attachment bars since I’ll be using a different bike on my cross country biking trip). I took the bike up and down the cobblestones of the road in front of my house and had absolutely no problems. Today I went on a trial run in preparation for my cross-country trip. I went over traffic bumps, through potholes (usually not intentionally! ), up and down several mountains/hills and over some rather rough road conditions. Everything held up beautifully. I barely felt it behind me. Even better, I never once felt any type of “push” as I applied the brakes. Since it’s a one wheel, it was nice that there is barely any additional width to worry about when in traffic. In short, I love this trailer! This week I finally got myself a Maya Cycle camping bike trailer. I have been looking at some bike trailers for quite some time now and when I saw the Maya Cycle for the first time, I was blown away by it’s ingenuity and well thought out design. It became a ‘must have’ for me. Assembly was an absolute breeze! I can’t even remember assembling it, it seemed to have come out of the box fully assembled! So, I give it an A+ for ease of assembly. It is a minor task at best. Quality and finish proved to be very good. I had the opportunity to use the trailer to go to a client’s site carrying 2 laptops and my briefcase. I also squeezed in misc. items like my toolkit, spare tube and bike lock. This would have been impossible to fit into my panniers. I would guesstimate each bag to be approximately 10lbs, so my total carrying weight is near or above 30lbs! The trailer is rated up to 66 lbs so I was well within it’s limits. Read more here. My Maya Cycle bike trailer is great! Fantastic as a cargo carrier, the capacity is huge, and it rides like a dream even with a heavy load. Other than the minor flag issue (I luckily found it on my return trip ) my experience has been a complete joy. I find myself using the trailer for every ride I take. First, I want to tell you how much I love the Maya Cycle bike trailer. I bought it at the Seattle Bike Expo 2 years ago. I live a car free life so I use the bike trailer all the time. It easily goes anywhere I decide to take it, on pavement or off-road. Two thumbs up for the new improved quick release, it only takes me a few minutes to mount the trailer to my bike. I am planning a trip to Montery California, using it for the first time on a multiple day ride. I just purchased a cross county MTB and plan on using the trailer on the John Wayne trail here in Washington. It will be a 3-day off road trek next September. Thank you! Despite the one wheel design, the trailer proves to be very rigid when making sharp turns and riding down 10 degree slopes with a full load of 50 lbs of camping gear. I like it because it’s light, quick to detach/attach when switching between bicycles and works good on the road and the trail. I would definitely recommend it. I took part, as a participant and presenter, in a workshop today at one of CAA’s offices. It was with the travel and tourism group. I have to say your trailer was 1) a huge help to me – see photo and 2) was really well received by the CAA employers. “The trailer to wheelbarrow is brilliant!” – a supervisor. I was able to carry all my equipment for the demo in and on your trailer to the eighth floor of the building!! (folding bike, laptop, some tools,etc). I have more CAA training, demos, presentations, and workshops were your trailer will be put to good use. I hope the inquires turn into sales for you (online). Just wanted to let you know my partner and I have purchased one of your bike trailers through a local bike shop here in Chilliwack, BC. I love it! Its convenient, light weight, and a real conversational piece in the grocery store. I use an electric bicycle and hardly know its behind me. Thanks so much for this. We first saw it on Dragons Den and always said when we got bikes we would also get one of your bike trailers. I have recommended the Maya Cycle bike trailer to a lot of people who ask about it, I hope you don’t mind. I really enjoyed the Maya Cycle bike trailer! It tracked really well behind my bike. A couple of times I went down hills at speeds of 40 mph or more! The trailer continued to track! I had a rack welded onto the back of the trailer to add a little extra room for some of my things. Altogether including my training I rode 2,500 miles using the Maya Cycle. I made sure that before the big ride, I put slime (flat plugging liquid) into the tires to keep the tires from deflating while riding. Everything still works great on my bike trailer. The components all held up very well!! Nothing broke. It was a great trailer and the entire device worked perfect! My husband and I actually own two Maya Cycle bike trailers. My husband got his early this year and I got mine when you were having one of your specials this summer. We like to take weekend bike trips to the river near our home where we meet our friends for barbeques in the summer. My husband carries all our barbeque/picnic gear and and I bring the dogs. Now, I know you say “NO dogs or pets” allowed but I find our “kids” are small enough and secured within the trailer for this to be ok. We put them in a recycling bin that sits perfectly in the bicycle trailer and is secured with bungee cords. I pad the bottom with blankets and they absolutely love the ride. Of course we secure them by attaching their leashes to the trailer itself. Hi Marc here, just wanted to update you a bit since I won the Maya Cycle bike trailer… it’s been phenomenally helpful for getting groceries (4 mile round trip) without worrying too much about space restrictions, as well as for transporting a new shop vac, and a wood indoor clothing drying rack that will make domestic life easier. I’ve also been able to transport some plastic storage bins and pink insulation foam sheeting to make feral cat shelters this winter. All in all there’s been no issues and again I cannot thank you enough for this wonderful utility that you have bestowed upon me. It’s been a back and life saver. All the best and continued success !! We ride a Rans Screamer recumbent tandem bike and chose the Maya Cycle bicycle trailer to enable us to do self-supported touring as well as giving us the ability to haul merchandise home from local markets. For hauling produce and other items we found a Rubbermaid tote that fits well and gives a bit of insulation for our items. Our area has lots of rolling hills and the trailer tracks perfectly even at speeds up to 30MPH on the downgrades. The wheelbarrow feature is great! We especially like this when we have the trailer loaded for touring.We put our sleeping pads and 2-person tent in the Maya Cycle Bag and then use the Rubbermaid tote for our sleeping bags,pillows, towels and stove. We use strong bungee cords to strap the tote to the top of the Maya Cycle Bag. We can easily move the trailer to wherever we want it by swinging the arms out into wheelbarrow mode. The kickstand works great to help stabilize the bike when we park it. It tracks and corners so well we tend to forget that we’re towing a trailer except when going up the steeper grades – then the extra weight we’re towing is apparent. I adapted a Greenspeed trike rack to fit over the rear wheel to carry assorted items needed for touring. Fully loaded for a camping trip we’ll weigh in at about 65 pounds, including the trailer. We are very happy with our choice of trailer. I really enjoy the Maya Cycle bicycle trailer! I use it to deliver packages to Fedex which is about 5 blocks away. I also use it to do bicycle delivery for folding bikes I am renting out to guests at nearby hotels. There has never been any trouble with Maya Cycle, however I suggest offering a smaller wheel so the trailer could be used with folding bikes with smaller wheels (like the Brompton). We received the Maya Cycle in perfect order and very timely, our son loves it!!!! He also loves that it fits a flat of Pilsner Urquell perfectly The competition does not. I completed my 400 km trip of dirt trails through the mountains of central British Columbia with my Maya Cycle bike trailer and am really happy with handling and performance of the trailer. I was able to fit everything (tent, sleeping bag, air mattress, food, cookware, clothing and spare parts) at about 25 kg. Most of the time I could hardly feel it behind me. Great little trailer, got lots of compliments. Look forward to using it again. Thank you! Hello. Let me start by saying that I love my Maya Cycle bike trailer. It makes my bike commute easier and allows me to carry far more than a change of clothes. 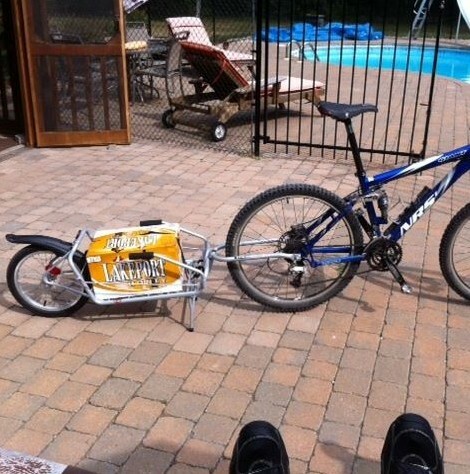 I was trying to modify my child carrying trailer for my bike commute but the results were less than stellar. Then I tried saddle bags and racks, but they could not hold all the stuff I needed to carry. The Maya Cycle bike trailer allows me to have a trailer with a low profile, low drag and yet carry a ton of stuff. l love the trailer and I get a lot of comments. I have even sold my brother on one. At the end of RAGBRAI, dipping our front tires in the Mississippi River. The trailer held up perfectly on the long journey. We are happy and proud to have completed it. The trailer comes with an original hitch for attaching the trailer to the bike. This hitch is much more complicated than it has to be for bikes with quick release. The newly designed hitch works great for quick release. Its especially useful when taking the trailer on/off the bike while traveling, when not in use, or with owners that have multiple bicycles. This better hitch was purchased at a substantial discount since I purchased it with my trailer. It would be better if the newly designed hitch came as standard equipment with the trailer, however, purchasing the hitch as an upgrade still made the trailer a substantially better value than any other competitor, and just as nice. The welds on the trailer are well manufactured, the actual weight matches what’s specified on the Maya website, the powder coat thick, smooth and strong. The trailer is strong enough for its specified load carrying capacity. The trailer tracks much better than the more expensive trailers. Its nice, the way the wheel barrow feature is designed right into the trailer. Seems to have good geometry, wheel base and perhaps steel is a better option for a trailer. The kick stand keeps load more stable when parked, or off the bike, especially when the load is top-heavy. The bag attachment is secure, and fabric is durable. The trailer fork runs smoother inside the steer tube of the trailer if you purchase a plastic bushing upgrade. The wheel and hub works OK, spins smoothly. The fender is OK, but I do not plan to use it. It installs easy, but I took it off and never installed the reflector. The tire doesn’t hold as much pressure as my road bike tires, but thats Ok. Its got a Schrader valve, I’d rather had a Presta valve, but maybe it’d be difficult to get a Presta tube in this size. The less cost is worth the difference. The quality is the same or better than what you would get with a competitors trailer. Even with the necessity of purchasing the quick-release upgrade, the trailer was much cheaper. I was a little put off by the fact that the upgrades came as a separate shipment rather than all together in the same package. I am definitely happy with the quality of this trailer, having the upgraded hitch really makes a big difference for quick release. Thanks Maya! The trailer, which is currently attached to my road bike, has performed flawlessly (aside from me loosing the linking ring), including today. I use it at least twice a week to haul my clothes, computer and assorted stuff 17 km to work. My only compliant is about the bag that comes with the trailer which fell apart on me, but that does not affect the performance. I love my Maya and I tell everyone who asks where I got it and how to get one.